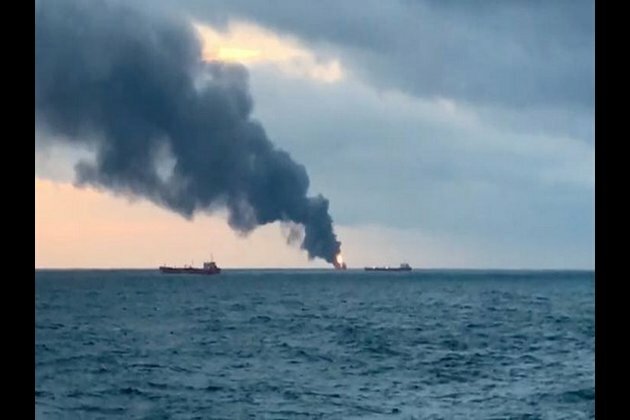 Ankara [Turkey], Jan 23 (ANI): Ankara has confirmed that four Turkish nationals have been killed while eight have been rescued from the two Tanzania-flagged vessels which caught fire in the Kerch Strait. Furthermore, Turkish authorities have stated that four citizens are still missing due to the tragic incident which took place on Monday. "As a result of the fire on the two Tanzania-flagged ships, Maestro and Kandi, in the Kerch Strait, four out of 16 of our citizens who were crew members died, eight were saved, and the search of four missing is ongoing," Sputnik quoted Turkish authorities as saying. Meanwhile, the Russian Federal Agency of Maritime and River Transportation (Rosmorrechflot) has announced that around 12 people were rescued, 10 have died and 10 are missing due to the fire. Rosmorrechflot further told Sputnik that no oil spill had taken place due to the fire on the two LNG tankers. Both Indian and Turkish crew members were on board at the time of the incident. The Indian Embassy in Moscow is in constant touch with the concerned Russian agencies to get more information on Indian nationals affected in the incident and to extend necessary assistance, India's Ministry of External Affairs Spokesperson Raveesh Kumar stated on Tuesday.